I come before you to report on the state of our Union, and I’m pleased to report that after four years of united effort, the American people have brought forth a nation renewed, stronger, freer, and more secure than before. One cannot help but recognize the difference between Reagan’s appreciation for Tip O’Neill’s House and Vice President Bush and the Senate and the Supreme Court before him and President Obama’s view of the same. There is, further, a preponderance of use of pronoun “I” that underscores an imperial presidency repugnant to many in one case and a more satisfying “we” in the other. For those consultants reading, it is the difference between “Velcro” and “Teflon” in presidential polling. I do believe, however, that one should give President Obama his due. There was a considerable breakthrough in the speech. The President chose to conclude his speech with a powerful illustration that focused away from himself, to America’s better angels. The speech, which would have been recalled for either its Constitutional challenge of misapplication of the executive order or, perhaps, its failure to plow new ground, or even his “Madmen” reference in dealing with women’s pay “inequality” (it could be remembered not because of the predictably approving applause of the Democrats, but because social science isn’t in agreement that there is a “war against women” in the workplace in the United States), will be recalled for his introduction of Sergeant First Class (SFC) Cory Remsburg to the nation. SFC Remsburg of the U.S. Army Rangers, 1st Battalion, 75th Ranger Regiment, was severely wounded by a roadside bomb in Khandahar, Afghanistan. He was in a coma for three months. He suffered brain damage. He lost vision in one eye. He has multiple, long term physical and neurological challenges, including paralysis, that he and his courageous family must face. 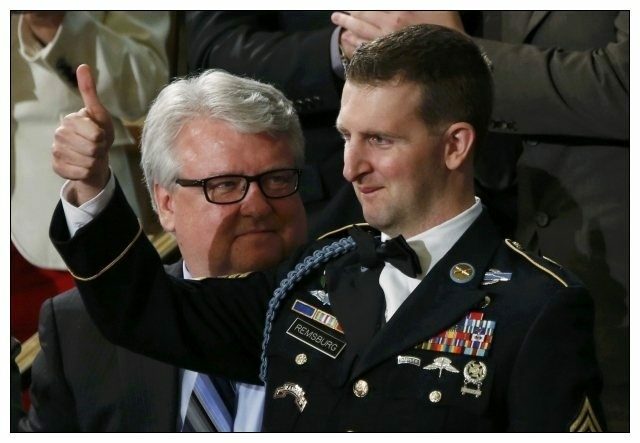 As his retired Air Force Reserve father, Craig, stood next to him, SFC Remsburg, also, stood, smiling, and saluted his Commander in Chief, as he, rightfully, received a grateful nation’s thanks. He stood with difficulty, yet with heroic pride, for thousands of others who could not stand and could not be there. They are not forgotten. America’s pride is her Armed Forces. Many tears welled up. Some sobbed openly. For many of us SFC Remsburg’s smile and Remsburg’s words were the undoing of the president’s speech to remind us that there are radical enemies of America who have not given up. Neither must we.